It is a fact that I have a minor obsession with Shrimp Spring Rolls. While I love the roll itself, I am mostly just looking for a vehicle for that delicious peanut dipping sauce they come with! Sooooooo GOOD. Light, fresh, doesn’t involve cooking….perfect for a hot summer’s day lunch. Never thinking that it would be a feat I could conquer, for months, I toyed with the idea of trying to make my own Shrimp Spring Rolls. If I was able to do this, I would be able to have an endless supply of them, readily available at my whim. So I got to work and did my best to recreate a healthier, Weight Watchers Shrimp Spring Roll Recipe that would satisfy my craving, yet still be low in Points. While my rolling and display skills may not be on par with professional Shrimp Spring Roll Maker Guys, the flavor profile I established was on point!! They were absolutely delicious. And the peanut lime dipping sauce was just as tasty as I hoped and prayed it would be. These light, fresh, low calorie Shrimp Spring Rolls make me super happy, and I make them much more often than I care to admit. 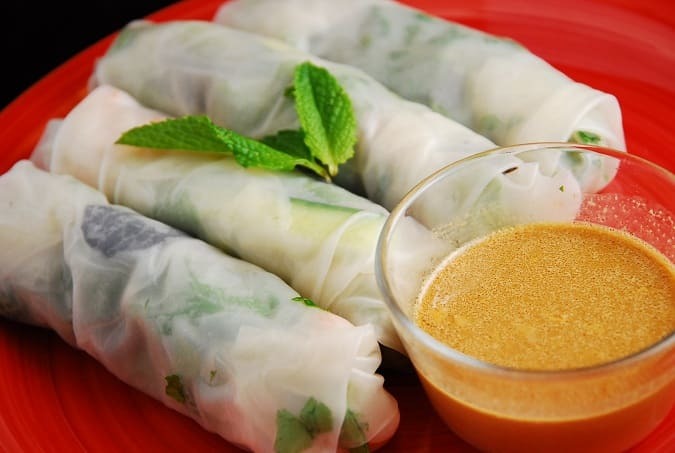 A perfect and delicious summer Weight Watchers lunch idea, these Shrimp Spring rolls are fantastic. Fresh, light, filling and very low calorie, you definitely get a mouthful of wonderful flavors in this healthy recipe. And the peanut lime dipping sauce is to die for! What brand rice paper wrappers do you use out of curiousity?